Tenby/Dinbych-y-Pysgod TownTenby is a delightful little harbour town and seaside resort, and it would be difficult to find a setting more picturesque. From the early 19th century, Tenby became a fashionable holiday destination and its attractions to the holidaymaker are just as obvious today, with the fantastic beaches stretching to the north, the west, and the south of the town. Walk along Tenby's South Beach toward Giltar Point and the start of the Pembrokeshire Coastal Path for fantastic views of Caldey Island. Stroll the narrow cobbled streets of Tenby itself or sit in one of the many cafes and people-watch other visitors to the gift shops, restaurants and public houses, or wander along the harbour, where you can board one of the cruises to nearby Caldey Island, or take a trip in search of the plentiful wildlife of this south-west coast of Wales. Tenby can be a serene, attractive destination sure to charm you, and those in search of spending time by the beach are spoilt for choice here, but Tenby can also offer plenty to do for the more active holidaymakers. Tenby has a railway station on the Carmarthen and Whitland line to Pembroke Dock. Tenby is a delightful little harbour town and seaside resort, and it would be difficult to find a setting more picturesque. From the early 19th century, Tenby became a fashionable holiday destination and its attractions to the holidaymaker are just as obvious today, with the fantastic beaches stretching to the north, the west, and the south of the town. Its hilltop position led to its early settlement as a Welsh stronghold, which was replaced in medieval times by a Norman Castle and walled town. Part of the town walls survive to this day and are an attractive feature at the entrance to the old town. 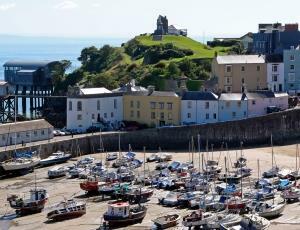 Tenby developed into a mercantile centre, a secure trading place with a well-developed harbour that fostered trade with Ireland and the continent. Unfortunately the civil war and the plague wreaked havoc with medieval Tenby, leaving it in the words of John Wesley, 'a dismal spectacle'. Fortunately the early 19th century saw Tenby transform itself into a holiday destination and it has followed this upward trajectory ever since.